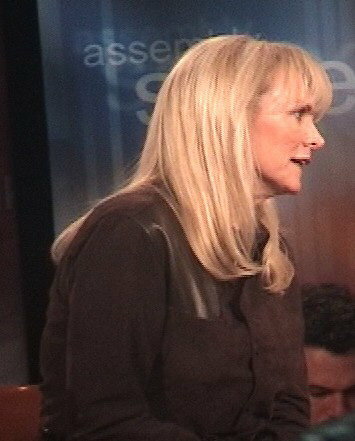 On a beautiful day in New York City, Jackie DeShannon sat in a small television studio at the First Amendment Center on Madison Avenue, and chatted with Speaking Freely host Ken Paulson about her life, career, and creative process. During the course of the interview, Jackie spoke about her experiences touring with the Beatles, her trip to Vietnam to entertain the troops, her influences, and, in a rare moment of candor, the ideas behind some of her songs. Jackie recounted that she landed the support slot on the Beatles� 1964 tour, which she remembers as six weeks of one-night-stands, because John and Paul heard her demos. They shared the same UK publisher at the time. She said she sang only uptempo songs, to try to keep the crowd satisfied while they anxiously and impatiently waited for the Beatles to take the stage. After the success of What the World Needs Now, Jackie �went into foxholes� in Vietnam to entertain the troops. � What the World Needs Now Is Love � Jackie said she related to the imagery and sentiments of the lyrics, having grown up surrounded by cornfields and wheatfields. She feels her emotional ties to the song, from her heart, is one reason for its success over the years. � Somewhere In America � Jackie shared that this was a rare incident when she wrote all the lyrics before the melody. She explained the task of the lyrics is to try to convince people to be more responsible with their lives. We need to work together, and take care of the Earth which nourishes us. � Boat To Sail � Jackie shared it was written for her husband, Randy Edelman, as a birthday present. � Bette Davis Eyes � She explained her original demo was more like Kim Carnes� version, but the producer heard it in a different way. Explaining her performance style, Jackie said she likes the personal approach. She enjoys shows that seem like the performer is in your living room, and the audience feels they really get to know the artist. As for her future activities, Jackie said she has plans to go to England, and tour Europe. This episode of Speaking Freely will air nationally in December. Check their website (www.freedomforum.org) and your local listings for time and channel.